PATTANI, 15 December 2013, (NNT) — Islamic Committees from 15 Southern provinces have joined hands holding a forum in Pattani to address the importance of unity and understanding in solving the ongoing violence in the South as well as to ensure that Thailand becomes internationally accepted as a center for Halal food and services. The forum, held from December 13 to December 15, was attended by representatives from 15 Islamic committees in the South, as well as those from the Central Islamic Committee of Thailand. The discussion centered on the importance of the roles of Islamic religious leaders in solving the ongoing Southern violence as well as how they should work together to improve Islamic-related businesses. Participants were encouraged to exchange ideas and provide opinions in order to come up with appropriate suggestions and measures to further improve the work of Islamic Committee in each province. Seven issues were discussed at the forum, which included local drug abuse prevention measures, educational and legal development of Islamic laws and its legal organizations, improvement of educational system, emphasis on women groups, economic development and occupational support, operation of Hajj-related businesses in Thailand, and preparation of local mosques to be ready for ASEAN Economic Community (AEC) in 2015. The organizers hoped that this forum would be a starting point that created mutual understandings in all sectors as well as to act as a driving force for various Islamic organizations to develop even further with a focus on Halal food and services in the provinces. 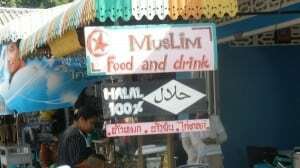 The Halal Science Center, Chulalongkorn University, will provide budget for 2014 in order to ensure that Thailand will become a center of Halal food and services worldwide.